Dropping into the Lake Tahoe backcountry with Lake Tahoe in the background. You can’t think of skiing without thinking of Lake Tahoe, California. Too much has happened here. The first ski racing in North America, chairlifts before 1940, the first Winter Olympics in the Western US, some of the best ski resorts in North America, and some of the biggest pro freeskiers on Earth including Shane McConkey and Scot Schmidt. Tahoe’s skiing history is lengthy, varied, storied, rad, innovative, and goes back 160 years. 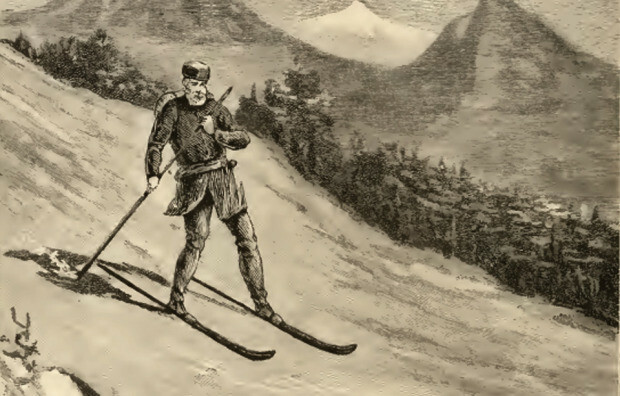 1850s – Organized ski racing in North America starts near Lake Tahoe in Johnsville when gold miners skied 15-foot long skis and hit speeds near 100 miles per hour. 1856 – “Snowshoe” Thompson was Lake Tahoe’s impossibly burly symbol of skiing. Thompson was the only link between the growing city of San Francisco and the rest of the continent. He’d regularly carry 60+ pounds of mail up over the Sierra Nevada from Placerville to Genoa and back on 9-foot long skis. This incredible journey would only take Thompson 3 days there and 2 back. 1924 – the first ski resort in Lake Tahoe was opened for Tahoe Tavern guest in Tahoe City. It was called Olympic Hill, but is now called Granlibakken. 1930 – Reno locals begin skiing modern day Mt. Rose ski resort. 1931 – The US Olympic Committee choose Granlibakken for the Olympic trials location in February. Wayne Poulsen, founder of Squaw Valley, placed 3rd in ski jumping. 1936 – Bill Bechdolt creates a 1,300-foot long rope tow in Tahoe City near the junction of highways 28 and 89 for skiers. 1937 – Wayne Poulsen purchased 1,200 acres in Squaw Valley for a ski resort. 1939 – Sugar Bowl ski resort erects the first chairlift in California only 3 years after the chairlift was invented. 1941 – Edelweiss Resort on Highway 50 opens with 1 chairlift and 3 rope tows. 1946 downhill ski champion, Lutz Aynedter from Germany, teaches skiing there. 1946 – Sierra Ski Ranch (Sierra-at-Tahoe) opens on Highway 50. 1949 – Alex Cushing opens the Squaw Valley Development Company along with world’s largest double chairlift, Squaw One. 1950s – Reno Snow Bowl opens where modern day Mt. Rose ski resort lives. 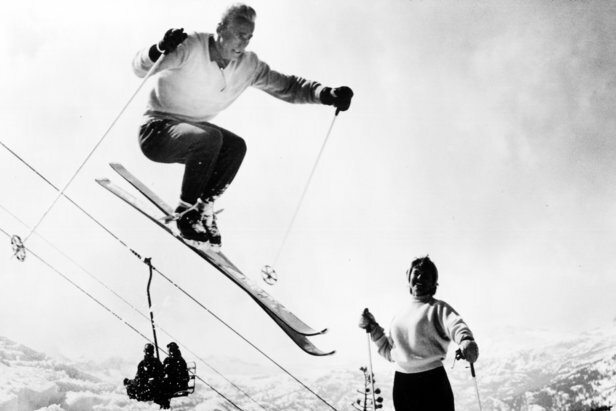 1955 – Heavenly ski resort opens with one chairlift, a base area, and rope tows. 1960 Winter Olympic Games at Squaw Valley, CA. 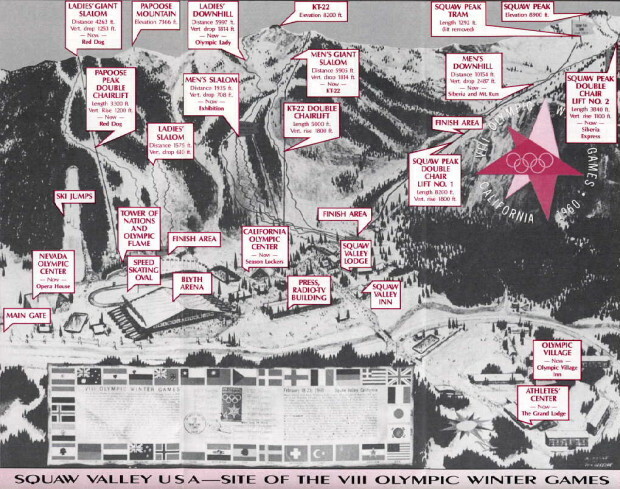 1960 – The 8th Winter Olympics Games come to Squaw Valley. First televised Olympics in History. Walt Disney orchestrates and pays for opening and closing ceremonies. 1961 – Alpine Meadows is founded by John Riley as an alternative to its ‘fast paced’ neighbor, Squaw Valley. Alpine starts with three lifts. 1972 – Kirkwood ski resort opens. 1972 – Northstar-at-Tahoe ski resort opens. 1983 – Scot Schmidt drops the Chimney at Squaw Valley in Warren Miller’s “Ski Time” and becomes the biggest extreme ski star to ever exist. 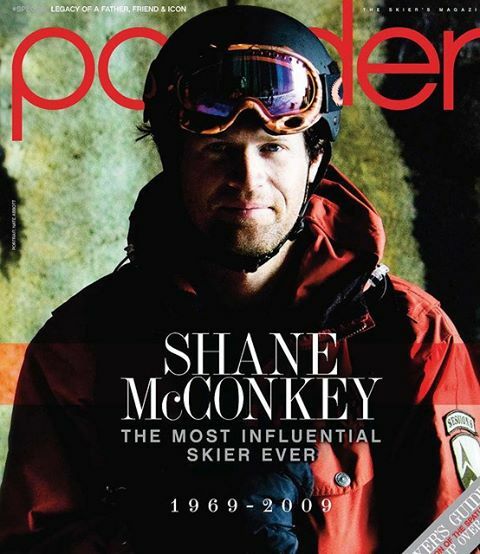 1995 – Shane McConkey moves to Lake Tahoe becomes freeskiing’s biggest icon, invents rockered skis, invents reverse camber skis, invents ski base jumping, invents switch flipping tricks, is one of the best freeskiers of all time. Up to 852″ of snow fell in the winter of 2010/11 in Lake Tahoe. 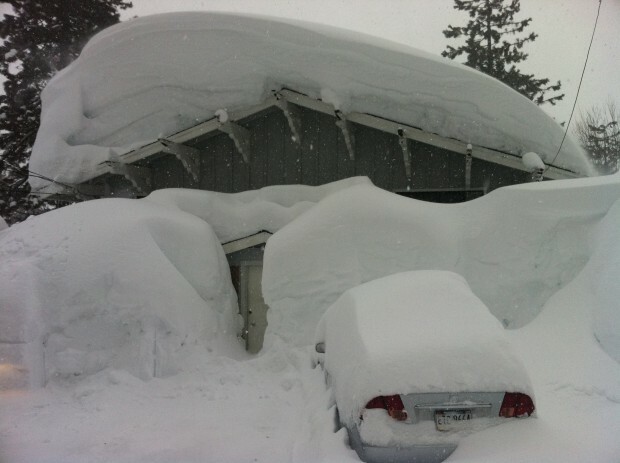 2011 – Lake Tahoe receives the most snow on record with up to 852″ of snowfall in one winter. 2015 – Sugar Bowl celebrates their 75th anniversary as Tahoe’s oldest ski resort. 75 years of Sugar Bowl, Tahoe’s oldest ski resort. Daron Rhalves ripping it up in 2013. 2025: Lake Tahoe has its first winter season with no ski resorts open due to 0″ of snowfall and is no longer a viable ski region due to people messing up the planet. Tahoe was not host to the first non-European winter Olympics. Lake Placid was. Dave, you’re right, just changed it. thanks for that. Cheer up Gary! Yes, it was the worst snow season ever, but it was still awesome. Low tide in Tahoe is still a whole lot better than most places. ah–the old days (2011) when it snowed in Tahoe. It will return. I may just be too old to enjoy it. In 1947 Bijou Skyway Park was built at the bottom of what is now Ski Run Blvd. in South Lake Tahoe. The rope tows were moved up the mountain in 1955 when Heavenly was opened. The first photo above is not within Lake Tahoe back country, but rather within Heavenly Ski Resort along the Skyline Trail at the top of the California side.